Alkaline minerals will promote fluid loss. Ketone bodies are natural waste products and are produced when you burn you own fat. Prevent ketone bodies from increasing fluid retention and keep those kilos dropping. Akalising while you lose weight promotes balance and health. Basica® Active is a supplement rich in alkalising minerals and citrates, to support acid-base balance and maintain healthy pH levels in our body. As we age or consume an acid-forming diet, our body's ability to cope with excessive acidity may diminish. This can contribute to chronic health issues such as bone loss, detoxification problems and fatigue. Mineral citrates provide long-lasting pH balance and do not disturb normal digestive processes. 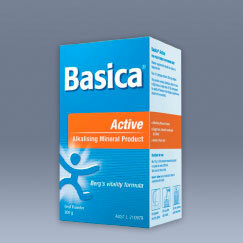 Basica® Active is free from: gluten, wheat, yeast, egg, dairy, lactose, nut, soy, purines and copper.